The climbing potential for this gem of a crag was first discovered due to rain. bouldering at the "Airstrip" to the multi-pitch trad and sport lines of Mangaotaki. being discovered over 30 routes had already been established is astounding. Hopefully this is a sign of things to come for this extraordinary climbing venue. has had little traffic there are a few sections which may have some loose rock. said.... most route development has involved the removal of as much "bad"
rock as possible so get out there and enjoy the routes! quality! (DBB)= Double Bolt Belay (LO)= Lower off. 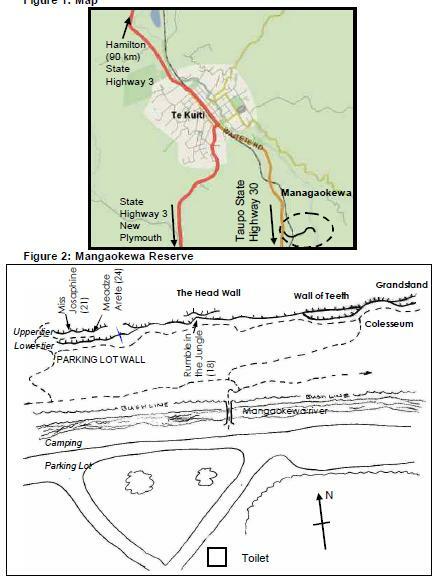 and drive down Mangaokewa Road as that this does not lead to the cliff at all. After turning into the reserve, drive down the hill to the carpark/camping area. to the right and will bring you directly up to the Colosseum. to leave them alone if you have ANY doubt. 4. If you are developing, trundle "unsafe" blocks EARLY in the morning. be subject to being hung by their toenails from the viaduct!! possible, rocks can still fall off, bolts can still fail, belayers can still "oops,"
there. No fixed gear is guaranteed. You are there at your own risk. www.freeclimb.co.nz hosted by Cliff Ellery. Written by Matt Natti.